The conventional wisdom is that the ultra wealthy get and stay that way by being smart about their money. In fact, families of significant wealth often neglect the simplest but most profound question in managing the family fortune: What is the wealth for? Freedom from Wealth provides a detailed road map for managing fortunes across generations. 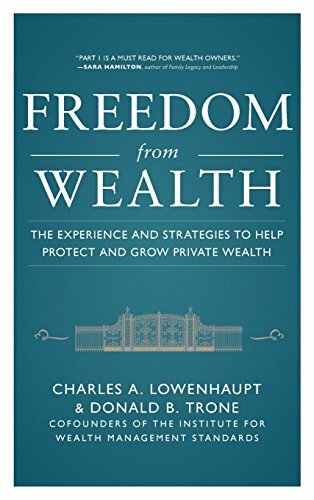 Charles Lowenhaupt, one of the world’s most respected experts on family wealth, and Don Trone, one of Investment Advisor’s “30 most influential people in financial services,” bring to life the wealth management lessons learned by some of the world’s richest individuals and families. Drawing on decades of experience, the authors offer an insider’s perspective and share best practices to help you manage your or your family’s wealth. Rich in detail and insight, Freedom from Wealth offers a thorough, step-by-step process that individuals and their advisors can apply to investment management, governance, succession planning, education, and philanthropy. Freedom from Wealth comes with valuable tools such as a model Private Wealth Policy Statement and a Self-Assessment Instrument that allow you to measure the success of your wealth management programs. Apply the methods of Freedom from Wealth to ensure that family money actually works for the family.